April 2016, spring at Sutter's Mill. A lot has changed since we arrived more than twenty years ago. We are older, and so is the ranch. Maintaining the fences, barns and pastures has become more challenging. But our love for the critters carries us forward. Since we stopped actively breeding fifteen years ago, our llama herd has declined from more than 60 llamas to a present count of 18. For a time we continued placing our llamas with new owners. Now, all who remain are of advanced age. They are friends and family who have been here all of their lives, a well settled community of senior citizens. The comfort and support that they receive from each other has convinced us not to offer any of them for sale. So - we have no llamas for sale. And the ranch is no longer available for public visits. What follows is an archive from the past, a web page that may give you a sense of the adventure that we enjoyed with our critters back in the day. Sutter's Mill Llama Ranch is located in the historic El Dorado County gold country of the Sierra Nevada foothills east of Sacramento, California. Along with Sandy and Bill Chickering and their son Matthew, Sutter's Mill is home to seventeen cats, fifteen chickens, five emus, four doves, two dogs, Wilbur the Pig, and one of the finest llama herds in the West. While our ranch property is only five acres in size, every square foot is in use. Our pastures are fenced, cross-fenced, and linked together around our house and barns by a series of gates and catch pens. We maintain three herds: one for our females and their babies, a second for our adult males, and a third for our yearling males which is situated between the two adult herds. Our neighbors have opened their fences to us, so our llamas have a total of seventeen acres for roaming and grazing. Each of our llamas has access to shelter from summer heat and winter rain. Fresh water and good quality grass hay are regularly available. Veterinary services are provided by Dr. David Turoff, DVM. People sometimes ask why we go to all of the effort required to maintain a large llama herd. That's easy . . .
California's first llamas may have arrived at this historic site back in 1853 . . . .
What Do You Do With Llamas? That's the first question people ask - or maybe right after the "don't they spit?" question. Our friends Deloris & Jack Gardner from Texas have a page on their web site that we like a lot! Here's a basic Llama Owner Information Guide. Whether you are a new llama owner, an old ranch hand, or just llama-curious, check out these basic llama facts from Wikipedea. 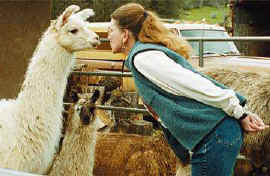 The International Lama Registry is the authoritative source for llama and alpaca registration. The llamas of Sutter's Mill are all registered with the ILR. For information about the competitive world of show llamas, visit the web site of the Alpaca and Llama Show Association (ALSA). 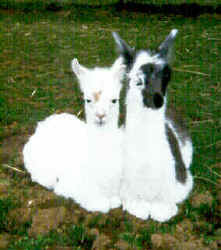 The LlamaWeb is a good information resource for anyone interested in owning or caring for llamas. 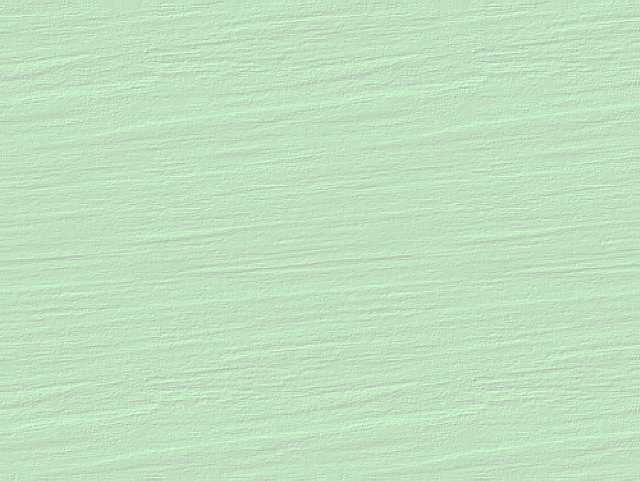 Llamas-information.com offers interesting llama information and stories, and a comprehensive link directory to other llama (and llama-related) sites. Here's a great listing of llama owner resources courtesy of Rainbow Ridge Llama Ranch. 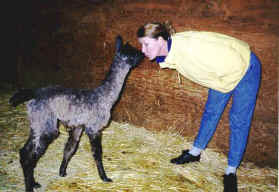 March 1999 Its Llama Baby Season!! Hey Pig!! You're part of the family! Camels, Zonkies and an Orangutan - Our exotic neighbors. We've posted a collection of photos so that our friends and family can see what we're up to "out at the farm". In 1997 Sandy arranged her special "Nose-N-Toes" collection of gifts and treasures especially for Llama People. Some were imported, others were local - all were unique! Nose-N-Toes still offers an array of interesting llama inspired gift items, including a number of stuffed plush llamas which have become the encouragement for Stuffed Ark.com, our lifelike stuffed animal web store.